The Late great John Entwistle, English singer-songwriter, musician, and producer and bass Player with The Who, sadly passed away 27 June 2002. Formed in 1964 by Roger Daltrey (lead vocals, harmonica and guitar), Pete Townshend, John Entwistle (bass guitar, brass and vocals) and Keith Moon (drums and percussion). The Who became known for energetic live performances which often included instrument destruction. 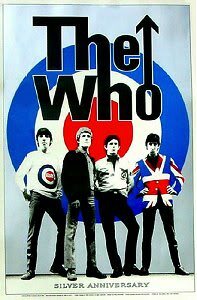 So far The Who have sold about 100 million records, and have charted 27 top forty singles in the United Kingdom and United States, as well as 17 top ten albums, with 18 Gold, 12 Platinum and 5 Multi-Platinum album awards in the United States alone. The Who rose to fame in the UK with a series of top ten hit singles, boosted in part by pirate radio stations such as Radio Caroline, beginning in January 1965 with“I Can’t Explain”. The albums My Generation, A Quick One and The Who Sell Out followed, with the first two reaching the UK top five. They first hit the US Top 40 in 1967 with “Happy Jack” and hit the top ten later that year with “I Can See for Miles”.Their fame grew with memorable performances at the Monterey Pop, Woodstock and Isle of Wight music festivals. The 1969 release of Tommy was the first in a series of top ten albums in the US, followed by Live at Leeds, Who’s Next, Quadrophenia, The Who by Numbers, Who Are You, and The Kids Are Alright. Moon died at the age of 32 in 1978, after which the band released two studio albums, the UK and US top five Face Dances and the US top ten It’s Hard, with drummer Kenney Jones, before disbanding in 1983. They re-formed at events such as Live Aid and for reunion tours such as their 25th anniversary tour and the Quadrophenia tours of 1996 and 1997. In 2000, the three surviving original members discussed recording an album of new material, but their plans temporarily stalled upon Entwistle’s death at the age of 57 in 2002. Townshend and Daltrey continue to perform as The Who, and in 2006 they released the studio album Endless Wire, which reached the top ten in the UK and US. They have also played Barnstorming sets at Glastonbury. The Who were inducted into the Rock and Roll Hall of Fame in 1990, their first year of eligibility; the display describes them as “Prime contenders, in the minds of many, for the title of World’s Greatest Rock Band.” Time magazine wrote in 1979 that “No other group has ever pushed rock so far, or asked so much from it.” Rolling Stone magazine wrote: “Along with The Beatles and The Rolling Stones, The Who complete the holy trinity of British rock.” They received a Lifetime Achievement Award from the British Phonographic Industry in 1988, and from the Grammy Foundation in 2001, for creative contributions of outstanding artistic significance to the field of recording. In 2008 surviving members Townshend and Daltrey were honoured at the 31st Annual Kennedy Center Honours. That same year VH1 Rock Honours paid tribute to The Who and Jack Black of Tenacious D called them “the greatest band of all time. This year the ever popular Severn Valley Railway 1940′s weekend takes place between June 27 & 28 and July 4 & 5 2015. As always there will be an intensive service of evacuation trains moving troops and their families up and down the line all weekend, as well as Costumed re-enactors wondering about all the stations and displays. Including a 1940’s house, an ARP Post, an Allotment, replica Operations Room, conscientious Objectors Display, replica air Raid Shelter and themed Replica Blackout Air-Raid shelter a Dig-for-victory Garden and Privy and a bombed out building. There will also be a display of Historic vintage 1940’s civilian and military vehicles at various stations like tanks, DUKWS, jeeps Scout Cars. 1940’s Vehicle and Jeep displays. The Engine Shed Railway Museum at Highley will be selling 1940s food. There will be an Evacuation of Kidderminster Station before the evening Big Band Show on Saturday 27th June and Saturday 4th July with a spectacular finale, 1940s stalls, Evacuation of school children at 10.42am on Saturday 27th June and on Saturday 4th July, British Army Medical Corps Field Hospital A wedding takes place at 2.30pm, a1930s caravan display. There is also Live entertainment from Natasha Harper, a VE Day Celebration Show, 1940s crooner Kevin Mack will be entertaining and The ever-popular Big Band Band-Show “workes Playtime” by the Allen Francis Big Band will be playing at Kidderminster Station . There is also a show entitled A Salute to the 1940′s and more entertainment will be provided by The Three Belles, Andrews Sisters Tribute Group, The Beven Boys, three piece band, Dicky Lines, Lola Lamour and Peter Wayre. There are also sales stands selling 1940’s clothing, uniforms and memorabilia. wartime Prime Minister Sir Winston Churchill, will also give a rousing speech and there will be a full sized replica Spitfire on Display plus an Evening dining service. Armed Forces Day (formerly Veterans’ Day) in the United Kingdom is celebrated annually on June 27 to commemorate the service of men and women in the British Armed Forces. Veterans’ Day was first observed in 2006. Although an official event, it is not a public holiday in the UK. The name was changed to Armed Forces Day in 2009. The four Armed Forces Dys so far have been held on the last Saturday of June. Plans for a Veterans’ Day were announced in February 2006 by then-Chancellor o the Exchequer, Gordon Brown, who said the aim was to ensure the contribution of veterans was never forgotten.